In a word… multifaceted. 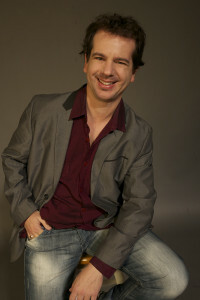 Juno-nominated Dylan Bell is a vocalist, instrumentalist (piano, bass, guitar, percussion), composer/arranger, music director and producer/engineer. Dylan has worked with groups ranging from vocal jazz, (Cadence, Hampton Avenue, the Swingle Singers, FreePlay Duo, The Watch), to vocal pop (Retrocity, the Nylons) to eclectic jazz and world music (Autorickshaw, Ray Montford Group), to classical (Nathaniel Dett Chorale; Lara St John) to flat-out rock ‘n’ roll (Honeymoon Suite). He’s played stages across the world from his native Toronto, to Stockholm, Sweden, to Calcutta, India, and his compositions and arrangements are performed across the world from Arnprior to Zurich. His book “A Cappella Arranging” (co-written with Deke Sharon) was published in 2013.